On 16 October 2018 - Assoc. 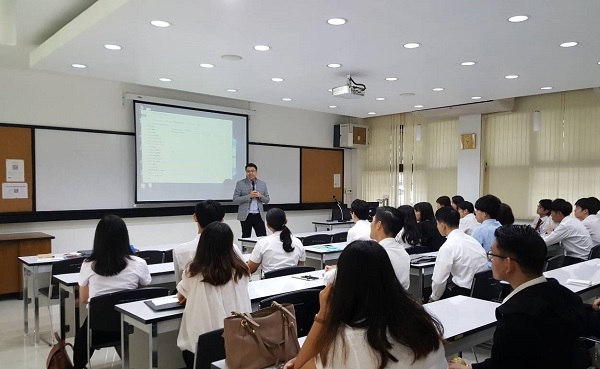 Prof. Dr. Kitti Prasirtsuk, Vice Rector for International Affairs, Thammasat University opened the Internship Exchange Program between Thammasat University and Osaka City University at East Asian Institute, Thammasat University Rangsit Campus. This Internship Exchange Program is a Short Program in Thailand and Japan. Thammasat’s Student also have been scheduled to go to Japan for this Internship Exchange Program in January 2019. Thammasat University and Osaka City University visited Japanese Companies: Panasonic (Thailand) Ltd., Daikin Industries (Thailand) Ltd., Komatsu Industries (Thailand) Co., Ltd., SIAM KUBOTA Corporation Co., Ltd., EXEDY Friction Material co., Ltd and the group visited Bang Pa - In Royal Palace, Ayutthaya Historical Park. This visit was a part of the Internship Exchange Program between Thammasat University and Osaka City University.